That Sgt Pepper taught the band to play. 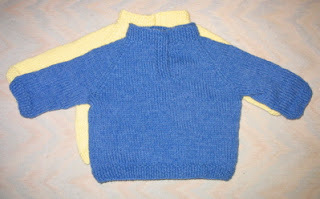 I finished the blue baby sweater today! I'll make more of these, but I'm taking a break for now. I've been thinking about making this sweater and I really like the variation with the placket in front. I'm jealous that you were in Ocracoke recently- I'm from NC and I miss the beaches!